Okay, comic fans, why do these two images have to do with one another? 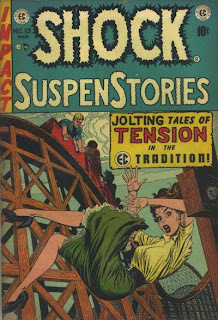 The image on the left is the cover from EC's Shock SuspenStories #13 from early 1954. 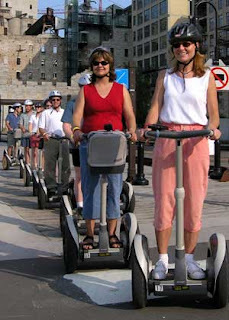 The image on the right is from a Segway tour of the Minneapolis Riverfront circa 2005. What relationship could these possibly have? The EC cover artwork was drawn by Mr. Jack Kamen, who's celebrating his 87th birthday today. Jack drew all sorts of wonderfully macabre material for EC, and you can find his work in many of the EC reprint material. The Segway was designed by Mr. Dean Kamen, Jack's son. Dean was a well-accomplished inventor before showcasing the Segway, and frequently uses his imagination to create things that ought to exist, even if they might not be the most marketable. In all sincerity, though, happy birthday, Jack! Absolutely gorgeous material, even if that Kefauver fellow didn't like it.